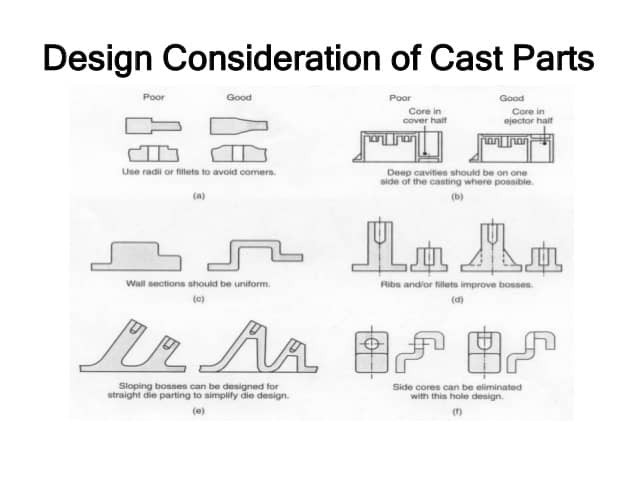 When designing casting the most important consideration is the effects of shrinkage during cooling. Other important factors include metal flow, and porosity. Avoid sharp corners – they can lead to hot tearing during cooling. Use fillets cautiously – they lead to stresses as they shrink a radius of 1/8” to 1” are acceptable. Avoid large masses – they will cool more slowly, and can lead to pores and cavities in the final part. Cores can be used to hollow out these large volumes. Metal padding ‘chills’ can also be placed inside the mold near large masses to help increase cooling rates. Avoid large flats – large flat areas tend to warp. Allow some give as the part cools – by allowing the shrinkage of one part to deform another slightly, the internal stresses will be reduced. Figures of 1-2% shrinkage are common. Put parting lines near corners – this will hide the flash. Straight Parting Lines – where possible a straight parting line will allow easier mold making. Use a Draft angle – A small angle of 0.5-2° on the vertical walls will make the pattern easier to remove. Wide Tolerances – because shrinkage occurs as the part cools it will be very hard to keep tight tolerances. Stress Relieve When Needed – Stress relief can reduce the effects of non-uniform cooling. Avoid thin sections – These will be very hard to fill, and will tend to harden quickly. Avoid internal features – These will require extra steps in mold making, and may create.